Here is Vela's non-disclosure agreement with temporary software evaluation license to facilitate proof of concept. Please download the .pdf document and return the completed and signed agreement to Vela at contracts@tradevela.com. WHEREAS Company desires to evaluate certain software products of Vela prior to licensing such software products. Evaluation License Grant (“Evaluation License”). Vela grants to Company a nonexclusive, nontransferable and nonsublicensable license to use its proprietary software (such proprietary software to be identified at a later date and confirmed via email in relation to the Proposed Transaction) in machine executable object code format (the “Software”) and related documentation (“Documentation”) solely for evaluation purposes in accordance with this Agreement and only during the Evaluation Term. 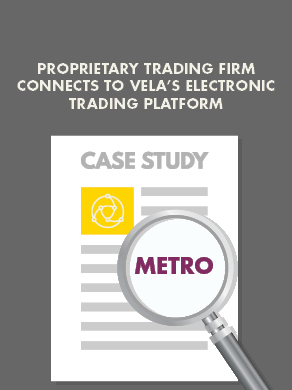 For the avoidance of doubt, the Software shall include any software provided by Vela to Company prior to the completion of the Proposed Transaction. Company may not install or operate the Software in any production environment or a computing environment other than one solely designated and used for evaluation and testing purposes. Company agrees that it will not decompile, disassemble, reprogram, analyze or reverse engineer or otherwise attempt to derive or modify the Software, in whole or in part, or write or develop any derivative software or any other software program based upon any of the Software. Evaluation Term. The term of the Evaluation License (“Evaluation Term”) shall commence upon installation of the Software and shall continue for thirty (30) days thereafter. Either party may terminate the Evaluation License for a breach of this Agreement by the other party. Upon any expiration or termination of this Agreement or the Evaluation Term, Company shall de-install the Software and return Vela’s Confidential Information. During the Evaluation Term, and for one (1) year thereafter, Company shall permit Vela to audit compliance by Company with this Agreement. Company shall cooperate with Vela in connection with such audit. Notwithstanding the expiration or termination of this Agreement, it is acknowledged that those rights and obligations that by their nature are intended to survive such expiration or termination will survive. Notwithstanding the foregoing the Evaluation Term may be extended at Vela’s sole discretion upon written confirmation or such extension from Vela to Company. No Warranty. THE SOFTWARE AND DOCUMENTATION ARE PROVIDED ON AN “AS-IS” BASIS WITHOUT ANY REPRESENTATIONS OR WARRANTIES WHATSOEVER. TO THE MAXIMUM EXTENT ALLOWED BY LAW, Vela DISCLAIMS ALL WARRANTIES EXPRESS OR IMPLIED, OF ANY KIND INCLUDING, BUT NOT LIMITED TO, IMPLIED WARRANTIES OF MERCHANTABILITY, FITNESS FOR A PARTICULAR PURPOSE AND NONINFRINGEMENT IN RELATION TO OR ARISING OUT OF THIS AGREEMENT. Limitation on Liability. TO THE MAXIMUM EXTENT ALLOWED BY LAW, IN NO EVENT WILL Vela BE LIABLE FOR ANY INDIRECT, SPECIAL, INCIDENTAL OR CONSEQUENTIAL DAMAGES OF ANY KIND, INCLUDING BUT NOT LIMITED TO LOSS OF PROFITS, LOSS OF USE, BUSINESS INTERRUPTION, LOSS OF DATA OR COSTS OF PROCUREMENT OF SUBSTITUTE GOODS, TECHNOLOGIES OR SERVICES, COSTS OF COVER OR PUNITIVE OR EXEMPLARY DAMAGES, IN CONNECTION WITH OR ARISING OUT OF THE FURNISHING, PERFORMANCE OR USE OF ANY OF THE SOFTWARE OR DOCUMENTATION, WHETHER ALLEGED AS A BREACH OF CONTRACT OR TORTIOUS CONDUCT, INCLUDING NEGLIGENCE, EVEN IF Vela HAS BEEN ADVISED OF THE POSSIBILITY OF SUCH DAMAGES. Vela’S LIABILITY UNDER THIS AGREEMENT, FOR ALL CLAIMS, OBLIGATIONS OR CAUSES OF ACTION ON A CUMULATIVE BASIS, WILL NOT, IN ANY EVENT, EXCEED ONE DOLLAR ($1.00). Other. The parties specifically disclaim the application of the United Nations Convention on Contracts for the International Sale of Goods of April 11, 1980.